This class will explore the human condition through individual development of ideas with discussions on formation of concept, approaches and materials. The class is designed for both advanced and beginning students regardless of disciplines chosen: landscape, figure, still life, abstract, etc. Students should bring whatever medium is preferred, an easel, if possible, and whatever previous work they would like to discuss and present. The Reflectionist, a cooperative of artists formed by the students of Alexander Shundi, exhibits twice a year. More information on the artists and the exhibits, which feature written dialogue between the artists the viewers, can be found at www.reflectionist.org. 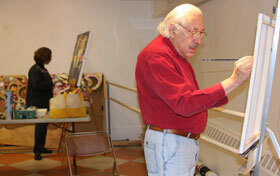 George Isaacson and Ann Chapin Fischer work in different styles during Intensive Painting class. Alex Shundi received his BFA and MFA from Yale University. He also received training at the Ecole des Beaux Artes in Paris and the Accademia Di Belle Arti Di Brera in Milan. He has since taught at WCAC, SUNY at Purchase, University of Bridgeport, and Silvermine College. He originated and was Dean of the La Coste-Silvermine School of Art in Provence, France as well as The Arts Work Forum in Millerton. He served as the Dean of Painting at Santa Fe International Academy of Art where he was also a professor of art. He shows internationally and currently exhibits at New Art Gallery in Litchfield, CT.